Prior to our October meeting, some of our members met during our “open sew” time to work on the charity quilt we are creating for QuiltCon 2019. For those of you not familiar with the concept, the Modern Quilt Guild issues a charity quilt challenge for every QuiltCon. The National MQG assigns the color palette and theme, then each participating member or guild needs to come up with the design, piece it, and quilt it. This year’s theme was tiny piecing, and the palette (shown below) was decidedly pastel. This year, Tina Craig led our team in not only the design of our quilt, but also in the production on Saturday. It’s always a fun morning when people come together for a good cause… especially when it involves sewing… am I right?! Special thanks to Lil for taking photos during our sewing time! Happy Spring! Here is your monthly recap of our April Meeting. Modern Fat 1/4 Swap - Next month's theme is "polka dots" - one person wins the whole pot! The Charity Committee is accepting your Log Cabin Blocks in pinks, purples & teals in the following sizes: 6.5, 12.5 and/or 18.5. Thank you in advance. MQX Show, Manchester, NH, April 8-11. A bunch of members are attending; next year we will coordinate farther in advance to organize a group trip. Can't wait to hear about how the show was! Saturday, April 25th, Rochambeau Public Library, Providence 1:30-3:30. Let's gather together to watch a MQG Webinar (Members: look for registration invite in your inbox). Sewing Day! We will be hosting open-sew before each monthly meeting. Bring all your gear (don't forget your machine's power cord!) and a project to work on. There are also often workshops and demo's that we will announce for future open-sew's. Thanks for a great meeting! See you all May 2nd! Don't forget - May Meeting will be in the Main Library, Community Room. Hello Modern Quilters! Here is your monthly recap of our March Meeting. Log Cabin Challenge is due next Month. Start with the "idea" of the Log Cabin Block and spin it off in any MODERN direction you want. Bring in your finished pieces as well as WIP's to share. Fat 1/4 Swap - Congratulations Tara on winning this month. Next month's theme is "flowers"
Saturday, April 25th, Rochambeau Public Library, Providence 1:30-3:30. Let's gather together to watch a MQG Webinar (stay tuned for which one). Wrap-Up on Sewing Day! We had a great group of quilters who were anxious to get out of their studios for some quilting, chatting and sharing. Thank you to Sue A. for leading a workshop of "Slice and Insert" We will collect blocks from everyone to put together a quilt to be given to The Cumberland Library as a thank you! Blocks are due in May. Contact us if you would like to get some fabric (gray and oranges) to make a block to contribute. Jessica took a long-arm class and sewed the alphabet on her quilt! 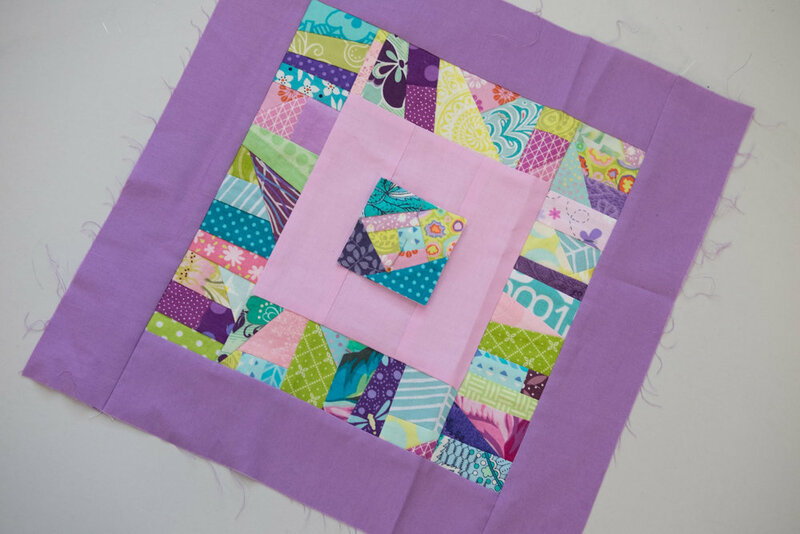 Tina's Spring quilt is made with "cool modern" scraps. Besties, MaryAnn and Denise shared their sister quilts! Denise also showed her "piecing with poppies" runner. Kathy shared her quilts from her Maine retreat. The green one is for her son. Meredith's photo transfer cat quilt was a hit! Suzanne's colorful quilt was beautiful. Pat's Log Cabin handing was based off a photo from Italy. Karen shared a wool quilted piece onto a scarf. Keep Calm & Keep Quilting cause Spring is on its way!!!............... see you all next month!